Go George officially began its first trial run on Monday December 8th 2014 and the buses have since become a common sight on George roads in mid town. The initial public response appeared to be one of caution, but as phased routes began operating and the sight of new buses were commonplace, the more locals could be seen at bus stops or travelling on the bus. The new buses are definitely a welcome sight. 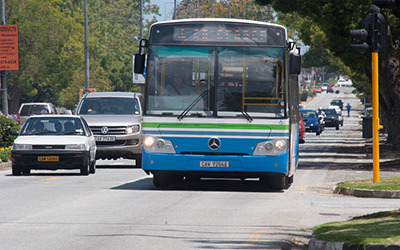 George continues to show high growth and since the opening of The Garden Route Mall a short distance from mid town, the bus service became a definite necessity. There is little doubt the bus service will grow to an inter-city service between Mossel Bay, Wilderness, Sedgefield, Knysna, Oudtshoorn and even Plettenberg Bay. George remains a very popular choice for retirement in the Garden Route and the Garden Route Mall, not being within walking distance of mid town, made the lack of a bus service noticeable. As a local it is extremely encouraging to see the service in operation and the sleek line buses definitely instill a sense of belonging in a town where things are moving in such a positive direction. The bus routes continue to grow as the phases are rolled out. The phase roll out has been carefully planned and each new route adds welcome transportation to many folk, who previously had no real form of transportation. Taxi services were generally far too expensive for low income earners or pensioners and the bus service now opens many new opportunities for students, workers and retired citizens. A strong part of the service focuses on tourism and tourists are encouraged to make use of the service. The buses are safe and the routes certainly designed to ensure all major tourist hotspots are covered. The Go George website provides information regards fares, time tables, routes (current and future), maps and more.